I've been sat here for almost an hour staring at the page and thinking "what the hell am I going to say". 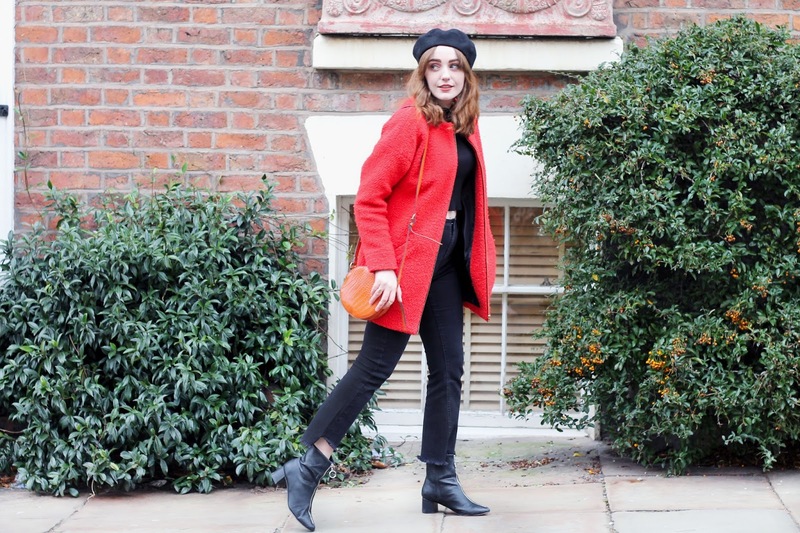 I know there's a trend in blogging at the moment to write a think piece alongside each outfit you share, and that's great. I enjoy reading them and occasionally, I enjoy writing them. But sometimes, you just don't have anything to say. 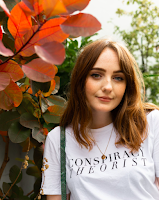 And sometimes, you just want to talk about the reason why you (well, I did) started blogging in the first place, clothes. So today, I'm talking through some new additions to my wardrobe. 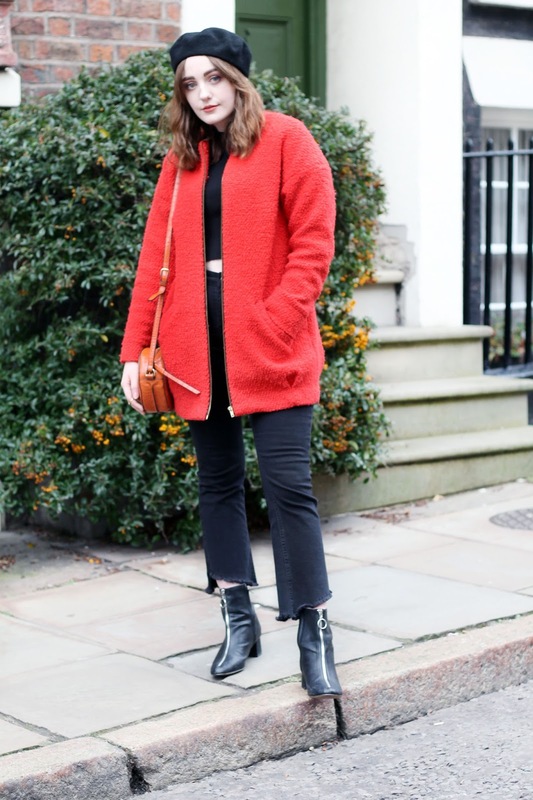 I mentioned in last week's outfit post that I am on the kick flare hype, and it's continued. Shortly after getting those gorgeous blue tartan kick flares, I picked up this pair in the Pull and Bear sale. They were originally around the £25 mark, but had a sticker on for £16. Then, I struck the shopper lottery. That golden moment where the cashier gives you a price lower than the one on the sticker. It happened. £9.99 - get in. About two hours after taking these pictures, I may have gotten another pair half price in the Urban Outfitters sale. Oops. Speaking of which, how fab are these pictures? Massive thank you to Jessi from Jessi Lou Blog for snapping these. We had a great morning catching up over coffee and chatting all things travel and Instagram. Here's to more regular meet ups with my fellow Liverpool bloggers in 2018. 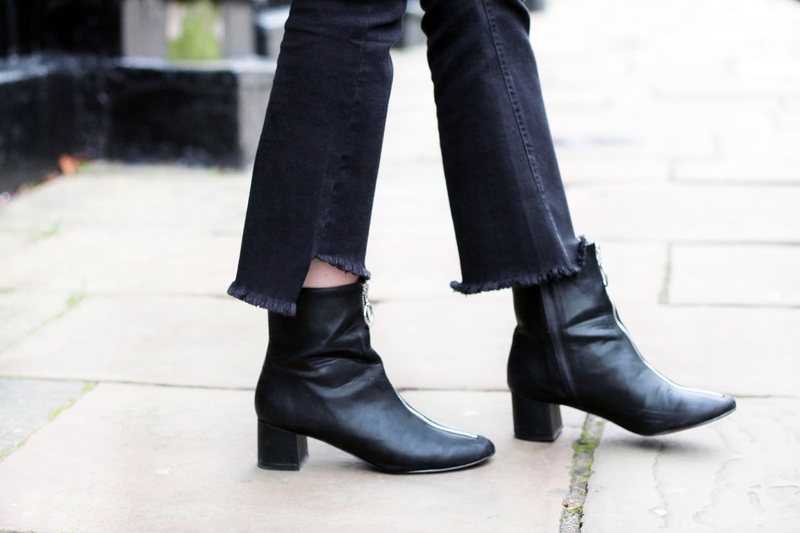 These kick flares aren't the only new additions to my wardrobe, either. This pair of zip up boots are the latest to my shoe collection, bought because I had a sudden realisation that I own no 'smart shoes' appropriate for the office. I was smart though, and picked a pair I knew I'd want to rock both in and out of work. The bag as well, is a new piece in my wardrobe. This round bag in mock croc print was another gift from Father Christmas. How did he know? I've taken a real shine to orange lately. 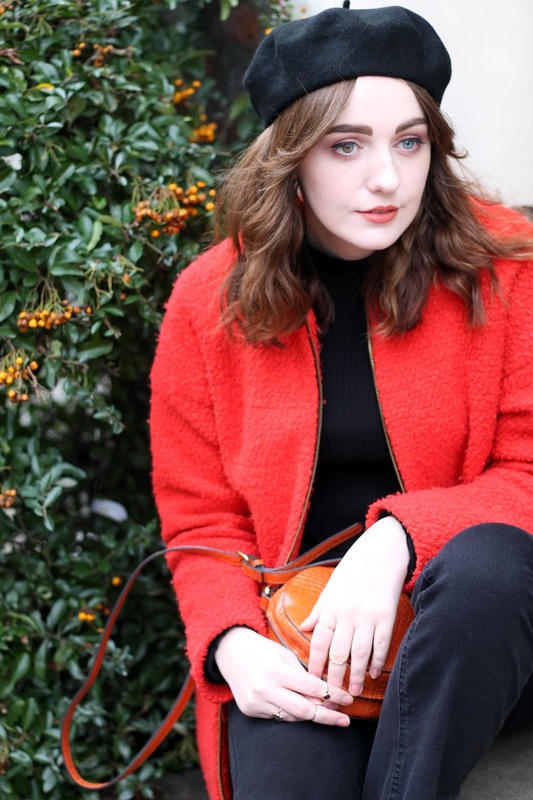 As a pale skinned gal, it's usually a colour I shy away from, except for this blood orange coat which has featured on the blog many moons ago. Shout out to you if you've been reading long enough to remember it. 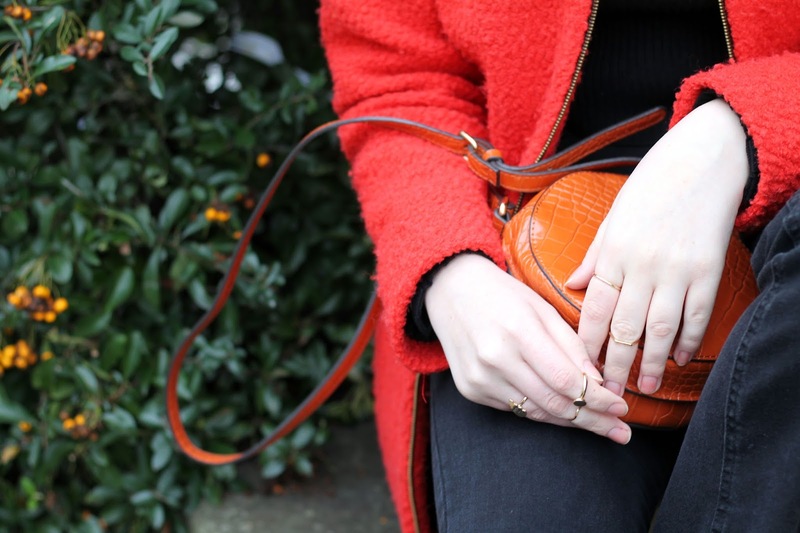 Lately, I've been eyeing up more orange pieces, especially those in rusty, burned orange tones to give me that 70s vibe I'm always searching for. This bag fits in perfectly, and I can't wait to pair it with my cream borg jacket and corduroy dungarees for my ideal 70s look. I've said it before, but it's amazing what a few new additions to your wardrobe can do for your confidence. Literally nothing makes me feel better than strutting around in an outfit that I love. If I think something looks good, or something is particularly trendy but is still ~me~, chances are I'll feel on top of the world. Of course, throw in a couple of mates and a cup of coffee, and I really am at an all time high. I know it's different for everyone, but these are my quick fixes to feeling good. I'd love to know what yours are. Is it walking the dog? Going for a swim? Baking a cake? Let me know, because maybe we can all try something new and who knows, me might discover a new feel good thing for ourselves. 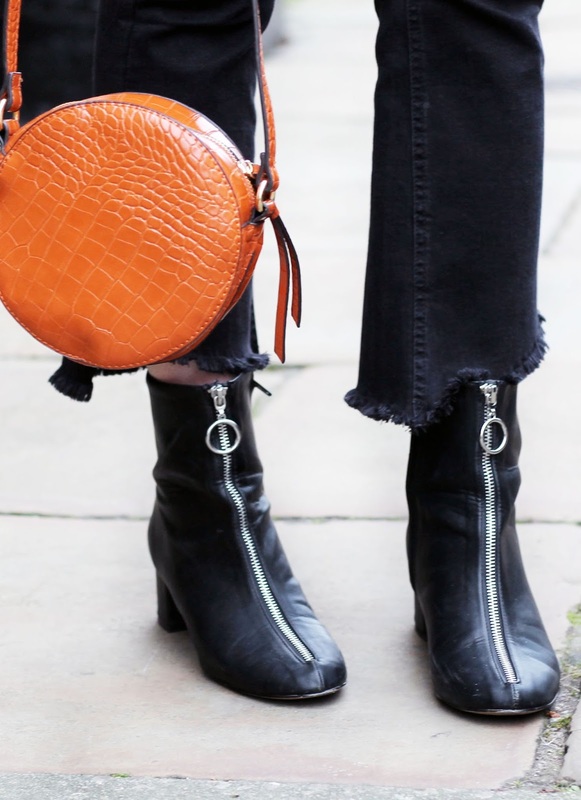 Have you got any new additions to your wardrobe? Link me to any Instagram posts, blog posts or videos because I'd love to see. You are absolutely stunning babe and I love your whole outfit ! The coat is stunning too !